A recent Pew Research Center analysis of census data found that in 2014, for the first time in more than 130 years, 18- to 34-year-olds in the U.S. were more likely to be living in their parents’ home than with a spouse or partner in their own household. A closer analysis of the data helps explain why: Adults in their late 20s and early 30s are living with their parents at record or near-record levels. Since at least 1880, which is as far back as the census data go, the youngest group of young adults (those ages 18 to 24) have consistently been the most likely to live with their parents – which makes sense, given that they’re also the most likely to be unmarried and/or still in school. 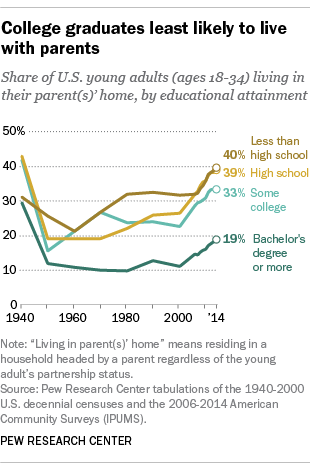 In 2014, half of all 18- to 24-year-olds lived in the home of one or both parents, up modestly from 46% in 2006. Despite the popular image of college-educated adults moving back into the family nest after graduation, young adults with at least a bachelor’s degree are the least likely to live with their parents (19% did in 2014). And the share of college grads doing so has risen less sharply than that of young adults with a high school education or less. Since 1960 (the overall low point for 18- to 34-year-olds living at home), the living-at-home share of college grads has grown by 74%, as opposed to a 103% increase for young adults with only a high school diploma and an 87% increase for those who did not finish high school. Among 18- to 34-year-olds as a group, record-high shares of black and Hispanic young adults (36% for each group) lived in their parents’ home in 2014, compared with 30% of white young adults. Looking at both education and race/ethnicity among 18- to 34-year-old adults, in 2014 non-Hispanic whites had both the highest (nearly 50%, for people without a high-school diploma) and lowest (17%, for college graduates) rates of living with parents. Interestingly, young-adult Hispanics without a high school diploma had almost the same relatively low rate (29%) of living in their parents’ home as Hispanic college grads (26%). One likely reason: Young Hispanics who have not completed high school are likelier to be immigrants, with their parents still back in their home country, than are college graduates.